Is it possible to earn high returns with low risk? With this outstanding business, the answer is yes. You've worked hard for your money. And you don't want to lose it by speculating on high-risk investments. So what you and many risk-averse investors like you are likely searching for is a stock that possesses a perfect blend of safety and strong return potential. If so, you've come to the right place. Out of all the stocks available in the market today, few offer as good a combination of these valuable attributes as The Walt Disney Company (NYSE:DIS). Read on to learn more about this fantastic low-risk wealth creator. Disney's strength comes from the diversity of its operations, which span across theme parks, resorts, movie studios, and cable networks, as well as a powerful consumer products licensing division. Each segment of this vast entertainment empire serves to strengthen the others, making the whole far more powerful than the sum of its parts. For example, a blockbuster new movie can boost results in Disney's studio entertainment division and create demand for Disney licensed consumer products such as toys, games, and books. It can also spawn new TV shows and drive traffic to Disney's theme parks and resorts. Moreover, Disney's diversified collection of businesses gives management the opportunity to invest across a broad area of the entertainment industry, thereby giving it more options to effectively allocate capital. The company excels at monetizing its valuable collection of assets, as evidenced by the more than $13 billion in operating cash flow and $8 billion in free cash flow it generated in 2016. 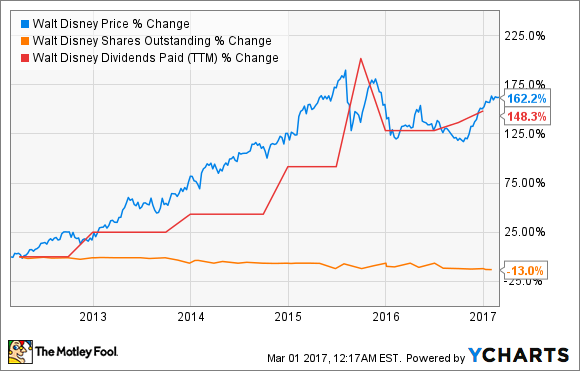 In turn, Disney is able to reward its shareholders with share repurchases and a rising dividend stream -- both of which support its stock price. Importantly, Disney is already making prudent moves to address what many would consider the biggest risks to its current business model: cord-shaving and cord-cutting. Disney is tackling cord-shaving -- consumers downsizing their cable TV bundles to less expensive packages -- by working to get its prized ESPN sports network included in popular "skinny bundles" like Dish Network's (NASDAQ:DISH) Sling TV. In fact, TV watchers can now get access to three ESPN channels and the Disney Channel for only $20 per month via Sling TV, compared to twice that amount for most basic cable packages. Cord-cutting is perhaps a larger threat, as an increasing number of consumers are canceling their cable subscriptions outright in favor or less expensive streaming options such as Netflix (NASDAQ:NFLX). Yet Netflix also provides Disney with a powerful new distribution platform, with Netflix paying a rumored $300 million to become the exclusive pay TV home for Disney's latest movie releases. Some industry watchers have even suggested that Disney could buy Netflix, though that's probably unlikely. What is expected to occur is for Disney to launch its own direct-to-consumer ESPN service to take advantage of the popularity of streaming options as well as to help offset subscriber losses from cable cancellations. In fact, Disney expects to launch the service this year. "We will be launching a direct to consumer sports service sometime in probably calendar 2017, but we're also very excited about what the potential of this is long-term," said CEO Bob Iger during Disney's first-quarter conference call. This highlights another Disney strength: its ability to adapt its business model to new technologies. For decades, Disney has successfully navigated a constantly changing tech landscape, and it will no doubt find a way to succeed in the internet TV era. All told, with its diversified revenue streams, strong cash generation, and adaptable culture, Disney is the type of stock risk-averse investors can buy today and comfortably hold for many years -- while enjoying excellent risk-adjusted returns along the way.